Stanislaw Lesniewski (1886-1939) was one of the leading Polish logicians and founders of the Warsaw School of Logic whose membership included, beside himself, Jan Lukasiewicz, Tadeusz Kotarbinski, Alfred Tarski, and many others. In his lifetime LeSniewski published only a few hundred pages. He produced many important results in many areas of mathematics; these stood in various relations to each ot… her, and to materials produced by others, and, in time, created more and more editorial problems. Very many were left unpublished at the time of his death. Then in 1944 in the fire of Warsaw the whole of this material was burned and lost -a considerable loss since a great deal of what is important could have been reconstructed from these notes. The present publication aims at presenting unique Lesniewski's materials from alternative sources comprising lecture notes taken during some of Lesniewski's lectures and seminars delivered at the University of Warsaw be- tween the two world wars. The editors are aware of the limitations of student notes which cannot compensate for the loss of the original materials. However, they are unique in reflecting Lesniewski's ideas as he himself presented them. 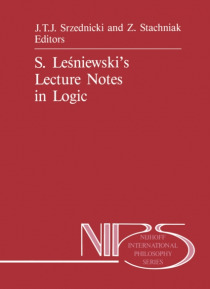 Already at the time of his death it was realized that these notes would provide a unique access to Lesniewski's own thought as well as a valuable record of some of the activities of the Warsaw School of Logic.